A celebrity dance show suddenly turned in to a celebrity fitness show, when yoga guru Baba Ramdev came on sets of ‘Nach Baliye 8. The makers added a spicy element to the show after inviting Yog Guru and Patanjali founder Baba Ramdev as its celebrity guest on the show. Not just the contestants, but even the judges – Sonakshi Sinha, Mohit Suri and Terence Lewis and hosts Karan Tacker and Upasana Singh, were seen trying out some of the special asanas taught by controversial public figure, Baba Ramdev. 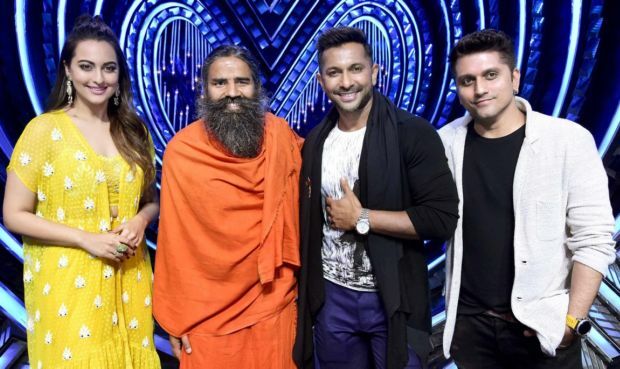 Ramdev was the celebrity guest on the famous dance reality show “Nach Baliye” along with judges Sonakshi Sinha, Mohit Suri and Terence Lewis. Hate him, love him or ignore him but you can’t deny the fact that Baba Ramdev is amongst the one of the most popular man in India.